RICH IN PROTEIN FOR LARGE BREED MUSCLE MASS, AND CALORIE-LIMITED TO PROMOTE HEALTHY WEIGHT AND REDUCE STRESS ON DEVELOPING BONES AND JOINTS. 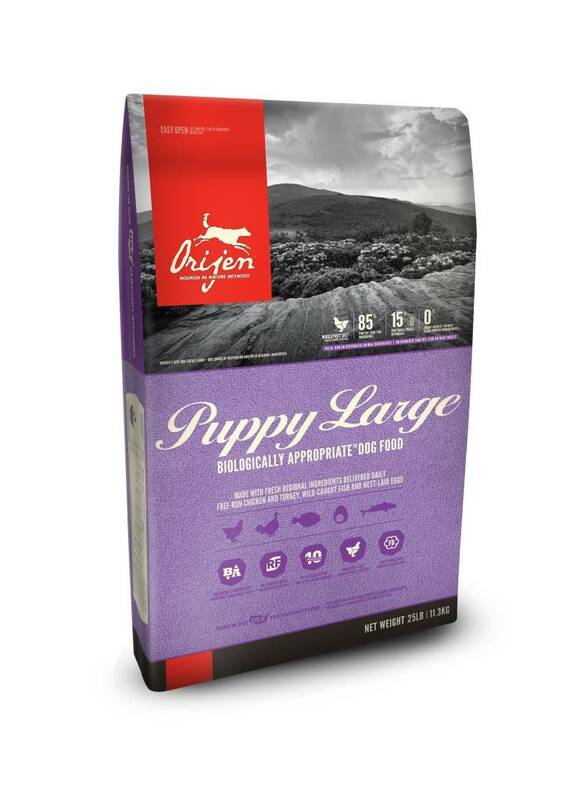 With 38% richly nourishing protein, and limited to 20% low-glycemic carbohydrates to nourish large breed puppies according to their evolutionary and biological needs. 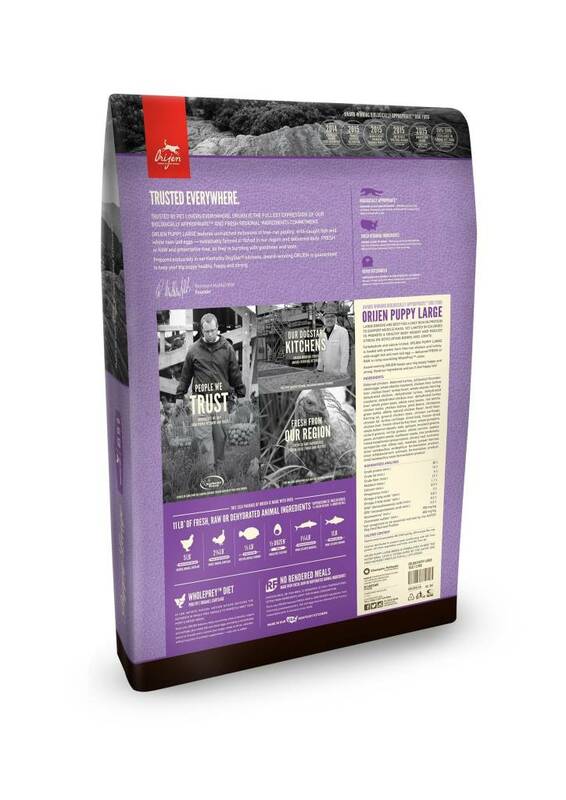 Free of rendered poultry meals, 1/3 of the meats are from dehydrated chicken and turkey (air-dried at low temperature from fresh meat) for a concentrated source of nourishing protein. Unmatched by any other food, 2/3 of the meats are FRESH (refrigerated, without preservatives) or RAW (flash-frozen, without preservatives), including the top 10 meat ingredients. 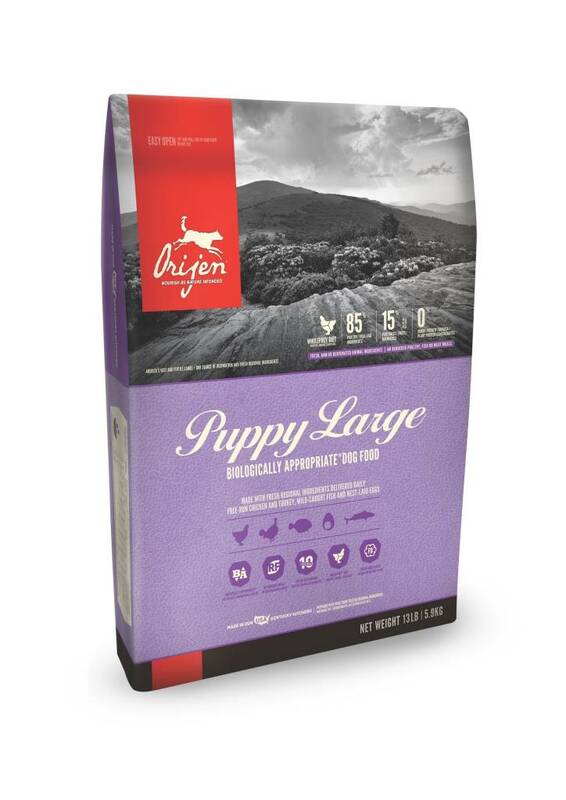 Infusions of gently freeze-dried liver enhance flavor and palatability naturally, making ORIJEN deliciously tasty, even for fussy pups. Deboned chicken, deboned turkey, yellowtail ﬂounder, whole eggs, whole atlantic mackerel, chicken liver, turkey liver, chicken heart, turkey heart, whole atlantic herring, dehydrated chicken, dehydrated turkey, dehydrated mackerel, dehydrated chicken liver, dehydrated turkey liver, whole green peas, whole navy beans, red lentils, chicken necks, chicken kidney, pinto beans, chickpeas, green lentils, natural chicken ﬂavor, lentil ﬁber, herring oil, ground chicken bone, chicken cartilage, chicken fat, turkey cartilage, dried kelp, freeze-dried chicken liver, freeze-dried turkey liver, whole pumpkin, whole butternut squash, kale, spinach, mustard greens, collard greens, turnip greens, whole carrots, apples, pears, pumpkin seeds, sunﬂower seeds, zinc proteinate, mixed tocopherols (preservative), chicory root, turmeric, sarsaparilla root, althea root, rosehips, juniper berries, dried lactobacillus acidophilus fermentation product, dried biﬁdobacterium animalis fermentation product, dried lactobacillus casei fermentation product.